We’re honored to host and manage this list with permission. The links to sites about children’s literature awards by states were originally compiled by Melissa Depper of Colorado’s Blue Spruce Young Adult Book Award Committee in January 2000 for PUBYAC, a discussion list for Children’s and Young Adult Librarians in Public Libraries. It was not intended to be comprehensive. Melissa updated the list in May 2005. We’ve updated it regularly since. Cynthia Leitich Smith is an author, not an awards coordinator for any state program (although she is an author member of the Texas Library Association). If you find a broken link or have any suggestions, please write. SEE ALSO Unique and Creative State Book Award Programs by Gayleen Rabakukk from Cynsations. Scroll down for a list of state awards based on other criteria. Oregon Reader’s Choice Award: (grades 4-6, 7-9, and 10-12) Oregon is no longer participating in the Pacific Northwest Young Readers Choice Awards. 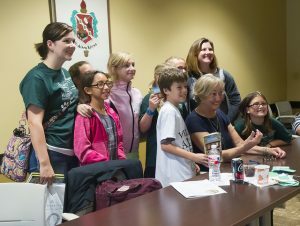 This site also hosts Texas Children’s Books, Authors, and Illustrators. Any Texas teacher or librarian with URLs to other Texas awards is encouraged to write me with that information.